Aero Express is an Authorized Distributor for the Barfield 2471F Test Set. Aero Express will buy, sell and trade the 2471F depending on your needs. The BARFIELD 2471F megohmmeter is designed to check the insulation breakdown in a variety of applications requiring a high voltage but low current. 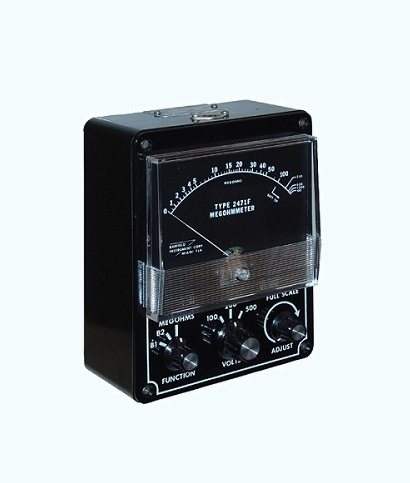 The 2471F Megohmmeter provides the operator with a simple, rugged, portable analog unit with selectable test voltages of 45, 100, 200 and 500 VDC. The range of test voltages allows him to quickly test and pinpoint insulation breakdown over a range of 0.5 to 1000 Megohm. The tester is battery operated, with no warm-up time necessary allowing completely portable, fast, reliable checks of antenna bonding, shielding, static wicks, ground straps, etc. Express Calibration is an Authorized ISO-17025 Calibration and Repair shop for the Barfield 2471F. Visit www.expresscal.com for full capabilities.